Recently, nearly 200 nations adopted an historical climate agreement at the COP21 conference in Paris. The agreement aims to help the world abandon fossil fuels this century and move toward cleaner ecological sources of energy expeditiously. A greener energy mix means an increase in the integration of decarbonised sources of energy in the contemporary age, which is directly linked to an increase in the use of electricity as the source of energy for more and more applications. In other words, switching coal-based or fuel-based applications such as heating, cooling or transport to power from renewable energy sources will lead to an increase in electricity consumption, an increase that will, ironically, mean a more efficient and sustainable use of energy. Therefore, proper KPIs need to be established to correctly measure and encourage the progress of this key transition in the world economy. This global electrification trend is directly impacting the maritime transportation despite the fact that this industry was excluded from the scope of the COP21 climate conference agreement. The future fuel for transportation is electricity, not only for road transportation, but also for the shipping industry. Initiatives are flourishing to promote and incentivise the switching over to electricity for vessels when docked, a reality today thanks to the current maturity of shore side electricity solutions and standardisation. While vessels are sailing, the technology is not yet available for the necessary batteries to have electricity as their only source of energy. However, a few limited pilot projects are progressing nicely on the use of battery-powered small ferries on shortdistance lakes or fluvial itineraries in the North of Europe. In summary, the electrification of maritime transport, as for other applications, is progressing parallel to the integration of more and more renewable and sustainable sources of energy into the land’s grid. This leads to a clear reduction in carbon footprint not only in the coastal and port areas, but everywhere, and not only for CO2 , but also for the rest of the pollutants for our health and the environment (PM, SOX , NOX , etc.) generated when burning maritime fuels. In the meantime while batteries become economically and operationally feasible for vessels at sea, other emissions reduction alternatives are being adopted such as 0.1% marine gas oil (MGO), LNG, biofuels or exhaust gas-cleaning systems. Depending on the specific application and the time spent in ECA zones (zones where emissions are limited), the use of one or another of these alternatives during a vessel’s sailing time will make most sense. However, for vessels during their berthing time, before considering the use of MGO or LNG, we must apply a longer-term, more ambitious perspective, seeking not only to reduce SOX , but to completely curb the generation of CO2 and the rest of marine air pollutants. In Europe, where the energy mix is one of the greenest on earth (15% renewable share in final energy consumption in 2013), and where a clear strategy is in place to make it greener and greener in the coming years (20% target in 2020, 75% target by 2050) (1), to switch from any fossil fuel (including LNG) to electricity from the grid is indisputably the right option for docked vessels. In other countries and regions in the world the energy mix evolution plans need to be taken into account as well before investing in solutions that will render just a partial result. Legislation is progressing accordingly as well. At a European level, both regulation and motivation strategies are in place to promote the adoption of cold ironing. On the regulation side, the Directive 2014/94/ EU on the Deployment of Alternative Fuel Infrastructures (DAFI), adopted in March 2014, states that all ports must be equipped to supply shore side electricity to vessels by the end of 2025, unless there is no demand or it does not make economic sense. The text of this directive may seem vague or easy to opt out of, but member states have until November, 2016 to enforce this directive into their national policy framework. It is then that we will see a clear definition and an action plan country per country. In terms of incentives, the European Commission is working on the creation of voluntary guidelines for green practices in shipping that will lead to port fee reductions for ships that adopt them. Shore side electricity capabilities are to be included in the scope. Spain is an early adopter of this initiative, and since the beginning of 2015, ship operators that connect to shore power in Spanish ports are already being granted 50% reduction in tax. Continuing with the theme of incentives, it is also worth mentioning the Directive 2003/96/EC that allows member states to exempt ship operators from taxes for the electricity that is provided to docked ships. This is already being implemented in some European countries; Sweden and Germany for example, and soon to be followed by Denmark. The directive is also being considered by Norway. Deep-diving is the best practice that Norway’s initiatives represent, and based on this country’s goal to be carbon neutral by 2030 if emissions cuts are made by other countries, and by 2050 regardless of international emission cuts, an incentive and funding program has been recently launched to economically support projects aiming to improve energy efficiency in all type of buildings and applications. Shore side electricity projects are not only eligible but also encouraged in the scope of this funding program. The program is managed by the governmental agency Enova and is allocating over US$200 million in 2 tendering calls in 2016. It comes in addition to the NOX Fund program already in place in the country since 2008, that is allocating $80 million per year to support NOX emission reducing measures. This amount is gathered from companies that emit NOX , by making them subject to a NOX tax. At European level, the TEN-T CEF funds program is clearly defining shore side electricity projects in ports as eligible to receive funds in categories such as innovation, infrastructure or motorways of the seas projects. Proposals can be awarded with funds covering up to 50% of studies, and from 10% to 80% of the execution project depending on the nature of the project and on the country being a cohesion or a non-cohesion state member. To invest in shore connection solutions makes most sense for berths where vessels spend several hours to periods of days or even weeks depending on seasonality. This is the case, for instance, for regular ferry and Ro-Ro lines, for offshore supply vessels (OSV), and for many containerised and bulk cargo vessels. To make shore side electricity implementation a success in a port it is important that a port is already in early stages of a project and all parties take the time to discuss together and come to an agreement on the costs and prices of electricity versus the cost of fuel, so that there is a return on investment for all, and it is a win-win situation for all including the electricity distributor, the port authority, and the terminal and ship operators. 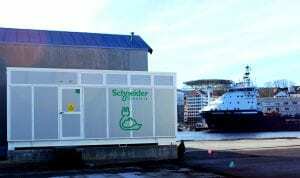 The investment required for the adoption of onshore power supply has decreased substantially in recent years, becoming affordable, as a result of systems standardization and the availability of prefabricated offerings such as ShoreBoX from Schneider Electric, a pre-tested shore connection solution integrated in a shelter, designed to minimizes projects costs, risks and deadlines. After the COP 21 climate conference agreement, the electrification of maritime transportation has never made more sense. Standardisation, regulations and manufacturers optimised offerings are paving the way for the adoption of already mature technologies such as shore side electricity. The time is now to implement them. Click here to download our White Papers to update the latest technical information. Nice Read. A lot of inputs. Thanks for your comment, I’m happy to learn that you found interesting information in it. 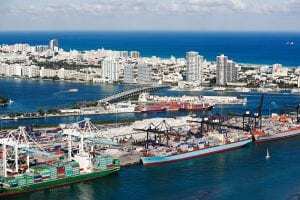 Ships: Rules and regulations getting tougher about Shore power A standard shore connection now for low voltage vessels Why is a regulation required for developing Shore Side Electricity and greener ports? Ports: How does Shore Power cut emissions and boost business?